You provide the Bible Verse and we'll do the rest. We will hand stamp a Bible Verse citation on our beautiful sterling silver disc - each precious letter one at a time. 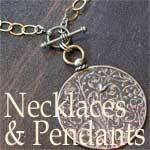 This is not an engraved piece of jewelry - but rather a delicate hand crafted sterling silver pendant. Disc pendant is round, about 7/8" and is then gently cupped for a delicate touch that catches the light just perfectly and added to an 18" sterling silver chain. Includes a complimentary laminated Prayer Card that we will typeset with your Bible Verse and beautiful velvet-lined gift box.